Dan Shumski is the author of Will It Waffle and the former keeper of the blog Waffleizer. Poor waffle irons tend to get tucked away in the backs of dark cupboards six days a week, only allowed out for Sunday brunch. It’s because the masses scoff at them as single-use appliances. Well, stop scoffing. Waffle irons are capable of much, much more than just waffles. We’re talking steak, potatoes, pizza and beyond. In fact, what I found was that once we ask the question “Will it waffle?”, the answers are practically limitless. Take a look. Grated potato is put in the waffle iron with a little bit of butter and rosemary. No need to stir or flip for crispy edges. The waffle iron crisps both sides beautifully. 2. Squeeze the shredded potato with a towel until it’s as dry as you can manage. 6. After 2 minutes, press down a bit on the lid to further compress the potatoes. (Careful: The lid may be hot.) Check the potatoes after 10 minutes. They should be just starting to turn golden brown in places. 7. When the potatoes are golden brown throughout, 1 to 2 minutes more, carefully remove them from the waffle iron. 8. Serve with grated cheese, sour cream, or ketchup. People might think you’re a little nuts for sticking a high-end piece of meat in the waffle iron. This typically lasts until you serve the steak, perfectly pink on the inside and seared with those distinctive markings on the outside. 1. Preheat the waffle iron on high. 2. Pour the salt and pepper onto a plate, mix to distribute evenly, and coat the steak with the mixture on both sides. 3. Coat both sides of the waffle iron grid with nonstick spray. Put the steak on the waffle iron as far away from the hinge as possible. (This allows for the lid to press down on the meat more evenly.) Close the lid and cook for 8 minutes. 4. If you have an instant-read thermometer, check the temperature of the steak after 8 minutes. For a steak cooked medium, the temperature should read 140°F. (A temperature of 130°F will give you a medium-rare steak; 155°F is well done.) If it needs to cook further, check about every minute and remove when it has reached your desired temperature. If you do not have an instant-read thermometer, check after 8 minutes, making an incision in the top of the steak about 3⁄4 inch deep. When the steak is ready to remove, you should see only a bit of pink toward its center. 5. Remove the steak and place it on a cutting board. Leave the waffle iron on, in case you need to cook the steak a bit more. 6. Allow the steak to rest for several minutes before slicing it in half and checking doneness. If it’s done to your satisfaction, turn off the waffle iron and serve. If you’d like it less rare, return it to the waffle iron and check after another minute. Let the steak rest once more before serving. This isn’t so much about how to make macaroni and cheese as it is about what to do with leftovers. Waffling the next day allows the outside to develop a nice crunch in the iron’s high, double-sided heat while the inside melts into perfection. 1. Cut the macaroni and cheese into slices about 1/2 inch thick. 2. Preheat the waffle iron on medium. Preheat the oven on its lowest setting. 3. In a small bowl, beat the egg with a pinch each of salt and pepper. 4. Set out 3 shallow bowls. Measure the flour into the first. In the second bowl, place the beaten eggs. Mix the bread crumbs with the cheese in the third. 5. Take a slice of the macaroni and cheese, and, handling it gently, coat both sides in the flour. Then dunk both sides in the egg. Finally, coat both sides with the bread crumbs, pressing the mixture so it sticks. Set aside the slice and repeat with the remaining slices. 6. Coat both sides of the waffle iron grid with nonstick spray. 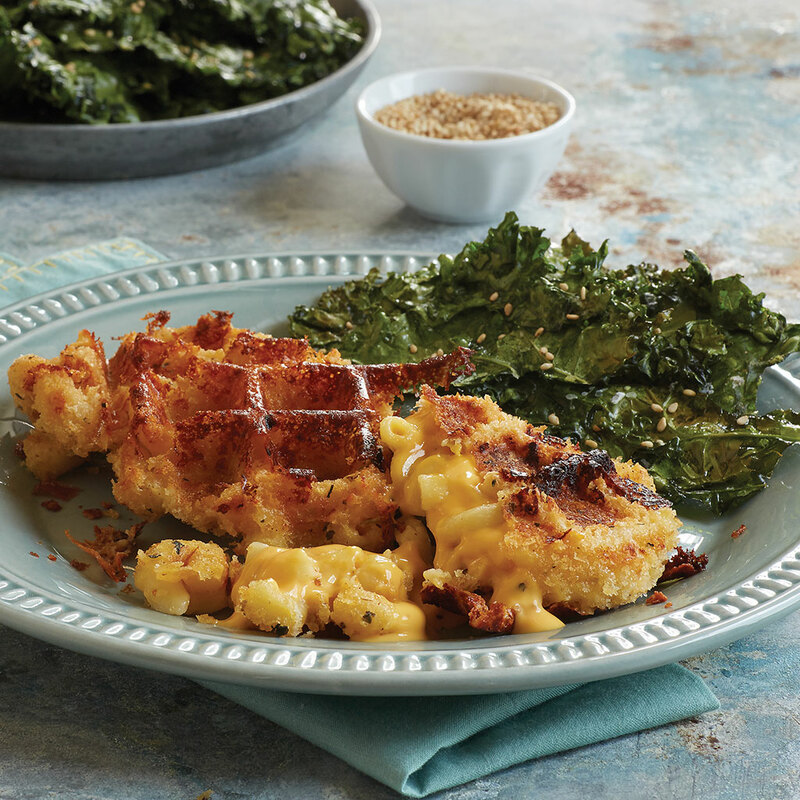 Place the macaroni and cheese slices in the waffle iron, close the lid, and cook until heated through and golden brown, 3 minutes. 7. The extraction process can be tricky. With a silicone spatula, loosen the edges of the macaroni and cheese. Use the spatula to gently pry the macaroni and cheese from the waffle iron and then support the bottom with the spatula while you lift it out with tongs. 8. Repeat Steps 5 through 7 until all of the macaroni and cheese has been waffled. Keep the finished macaroni and cheese warm in the oven. The marinara sauce pools in the nooks and crannies of the waffled crust while the cheese takes care of the rest. This recipe calls for using a broiler to melt the cheese on top, but if that seems like cheating, you can make a calzone instead with the instructions below. 1. In a large bowl, combine the flour, yeast, and salt. Add the water and mix until the dough is shaggy and most of the water has been absorbed. Turn the dough out of the bowl onto a lightly floured counter and knead until it is just blended but not too smooth. Cover the dough with a damp towel or plastic wrap and let it rest for 10 to 15 minutes. 2. Knead the dough until it is fairly smooth, 5 to 10 minutes. 3. Coat a bowl with the oil, add the dough to the bowl, and turn to coat. Let the dough rise in a warm place, covered with plastic wrap, for 2 ½ hours, or until nearly doubled in size. 4. Dust your work surface with more flour. Punch down the dough, divide it into 6 pieces, place the pieces on your work surface, and form each into a smooth ball. Allow the pieces to rest for 5 minutes, covered by a cloth or plastic wrap. When you are ready to waffle, remove the wrap and shape each piece into a disk, pulling gradually on the dough to expand it. If it resists, let it rest for 5 minutes before continuing. 5. Preheat the waffle iron on medium. Coat both sides of the waffle iron grid with nonstick spray. 6. Pull a disk of dough evenly until it’s as thin as possible, roughly circular, and about 8 inches in diameter (but no bigger than your waffle iron). If the dough tears, repair the tear by pushing the dough together and continuing to stretch other parts of the dough. Repeat with each dough disk. 8. Put a disk of dough in the waffle iron and cook about 5 minutes, or until golden brown. 9 Remove the disk from the waffle iron and set it on a baking sheet. Repeat Step 8 with the remaining disks. 10. Top each waffled crust with about 1/2 cup of sauce, 1/3 cup of cheese, and a handful of the tomatoes, if using, and place the baking sheet under the broiler for about 2 minutes, until the cheese is melted and bubbling. 11. Remove the pizzas from the broiler, sprinkle with basil, and serve warm. 1. After the disks have been formed in Step 6, put 1/4 cup of sauce, 1/4 cup of cheese, a few tomatoes, if using, and a small handful of basil on one half of the dough, leaving a margin of about 1/2 inch all around. Fold over the dough to envelop the toppings in a pocket and pinch the edges to seal. Place the pocket in the waffle iron and close the lid. 2. Cook for 5 minutes and then check. The cooking time will depend on the thickness of the dough. Calzones with very thin dough may be done after 5 minutes. Thicker dough may take a few more minutes. The dough should be golden brown and the cheese should be melted. Few things can be said to truly improve on holiday classics. But stuffing with built-in gravy receptacles? That is a landmark improvement. Make them now. Make them every day until Thanksgiving. Note: Many kinds of bread will work here, including sandwich bread and baguette—alone or in combination. Cut any slightly stale pieces or ends into cubes and stash them in a zip-top bag in the freezer until you accumulate enough for this recipe. Thaw at room temperature for an hour before using. 1. Place the olive oil in a large skillet over medium heat. Add the onion and celery and sauté until the onion is soft and the celery is beginning to soften, about 5 minutes. 2. Add the salt, pepper, poultry seasoning, and dried sage and cook for 1 minute more to heat through. Remove the pan from the heat. 3. Place the bread cubes in a large bowl. In a small bowl, whisk together the butter and chicken broth, then pour that mixture over the bread. Add the vegetable mixture and stir. 4. Preheat the waffle iron on medium. Preheat the oven on its lowest setting. 5. Allow the stuffing mixture to sit for 5 minutes to absorb the liquid completely, stirring it once or twice. 7. Close the lid and press down to compress the stuffing. 9. Repeat Steps 6 through 8 for the remaining stuffing mixture. Keep completed stuffles warm in the oven. The high heat caramelizes the natural sugars of the fruit. The spiciness of the chile powder nicely sets off the sweetness of the pineapple. 1. Preheat the waffle iron on medium. Coat both sides of the waffle iron grid with nonstick spray. 2. For fresh pineapple: Lay the pineapple on its side and cut off the crown and the bottom of the pineapple to give you two flat ends. Stand the pineapple upright and trim off the sides of the pineapple, starting with your knife at the top and working your way down. A few pieces of skin may remain. Use a small spoon to remove them. Turn the pineapple on its side and make even slices about 1/2 inch thick. If the slices are thicker than 1/2 inch, the waffle iron may not be able to press down evenly across the fruit. For canned pineapple: Open the can and drain the juice from the fruit. Set the sliced pineapple on a plate covered with paper towels and blot the slices dry. You want as little residual liquid remaining as possible, because the juice can burn in the waffle iron. 3. Place the slices of pineapple on the waffle iron grid and close the lid. For fresh pineapple, cook for 4 minutes before checking. For canned pineapple, cook for 1 minute before checking. When the pineapple is starting to show golden brown waffle indentations, remove it and place it on a platter. 4. Dust the pineapple with chili powder and serve. This is perfect for hot summer nights when the idea of turning on the oven is unbearable. Arrange the tuna on the salad so that the waffle marks show. That’s why we’re here, after all. 1. Cook the eggs: Place the eggs in a small saucepan and fill it two-thirds full with water. Bring the water to a boil over medium-high heat, then turn off the heat, remove the saucepan from the burner, and cover it. Let it rest for 10 minutes. Run the eggs under cold water for a minute to cool them, and set aside. 2. Blanch the green beans: Bring a small saucepan of salted water to a boil, and plunge the green beans in for 30 seconds. Remove them and place them in an ice-water bath to stop the cooking. Remove the green beans from the ice water after 1 minute and set aside. 3. Boil the potatoes: Place the potatoes in a small saucepan and cover with at least an inch of water. Add a generous pinch of salt to the water and bring to a boil over medium-high heat. Once the water boils, reduce the heat to low and allow the potatoes to simmer for 10 minutes. They’re ready when they can be pierced with the gentle poke of a knife. Remove the potatoes, drain them in a colander, and let cool. 4. Preheat the waffle iron on high. Coat both sides of the waffle iron grid with nonstick spray. 5. Place the tuna steak on the waffle iron as far away from the hinge as possible. (This allows the lid to press down on the tuna more evenly.) Close the lid. 6. While the tuna cooks, lay down a bed of salad greens on a large serving plate. Peel the eggs, slice or quarter them, and arrange them on the lettuce. Evenly distribute the green beans, potatoes, olives, and tomatoes on the salad greens. 8. Remove the tuna from the waffle iron and cut it into slices about ½ inch thick. Arrange the slices on the salad, with the waffle marks facing up. 9. Sprinkle the salad with salt and pepper. Dress the salad sparingly. Serve the rest of the dressing at the table. In a small bowl, whisk together the olive oil, vinegar, and mustard until well combined. (Or shake the ingredients in a jar with a lid.) Taste and add salt and pepper as necessary. If you want recipes for more things you didn't know you could waffle, you can order the full cookbook here.